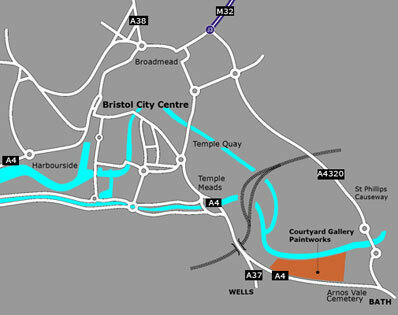 Paintworks is located on the Bath Road (A4) near Arnos Vale. From the end of M32, follow the signs to Temple Meads Station, continue past the station on the Bath road (A4), keep left where the road forks to Bath and Wells. Continue along the Bath Road for about half a mile, Paintworks is located on the left hand side (opposite row of tall Victorian houses).